September - March buses run from 08:30 until 18:00. April - August buses from 08:30 - 17:00. Catching the bus in the morning means you get a head start on the day and avoid traffic. We are comparing Sydney & Bondi Hop-On-Hop-Off-Explorer Bus Tickets Prices from leading ticket suppliers and Try to find you Cheap tickets prices on the market. 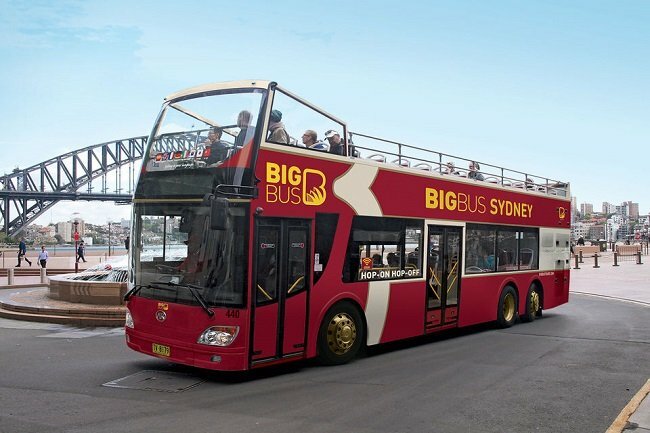 The explorer bus ticket allows you unlimited rides on Sydney's double decker hop-on hop-off busses. There are 33 stops in total across the city and you can hop-on and hop-off at any of them. You can make as many stops as you like throughout duration of your ticket. There's no limit how many times you hop-on and hop-off! The Bondi Route heads out along the coast to the famous Bondi Beach, Sydney's most popular surfing destination and top sunbathing spot. The bus ride offers an alternative way to view the city and if you take a seat on the top-deck you'll enjoy fabulous views. Buses on the Sydney Route run every 15 minutes while buses on the Bondi Route run every 30 minutes. Buses run throughout the day from 08:30 till 18:00. Your Experience With Sydney & Bondi Hop-On-Hop-Off-Explorer Bus Tickets? Enjoy great views over Bondi Beach from the top-deck of the bus! Visit the opera House and the Sydney Harbour Bridge. Alight at the Maritime Museum or visit the Chinese Gardens for a stroll. Maritime Museum or visi the Chinese Gardens. Head down to the rocks for lunch before hopping back on board and heading over to Bondi Beach. Take in spectacular views over Centennial Park en route to Bondi. What Sydney & Bondi Hop-On-Hop-Off-Explorer Bus Tickets Includes? Stop 3 Cook and Phillip Park. Stop 6 El Almein Fountain. Stop 8 Sydney Opera House. Stop 11 Hyde Park North. Stop 13 Power House Museum. Stop 17 Convention Centre ( Temporarily closed due to construction). Stop 20 King Street Wharf. Stop 24 Circular Quay (George street). Stop D Cook and Phillip. Unbiased comparison of Sydney's Hop-on Hop-off Bus Tours operators (Sydney Explorer Hop-On Hop-Off Bus And Harbor Cruise Vs Big Bus Sydney And Bondi City Sightseeing ) based extensive research, Tripindicator team came up with comprehensive recommendations about Sydney City Bus tours which helps you choosing which Sydney Sightseeing Bus Tour is best for your travel. Unbiased comparison of Sydney's City Passes (Sydney Attraction Pass Or Sydney Flexi Pass Or Australia Multi City Flexi Pass) based extensive research, Tripindicator team came up with comprehensive recommendations which helps you choosing Best Sydney Skip-line attractions pass for your travel. Rise early to make the most of your 24 hour bus ticket. Don't waste a single second! Travelers Reviews about Sydney & Bondi Hop-On-Hop-Off-Explorer Bus Tickets? This bus tour is accessible for wheelchair users. Make sure you dress appropriately for the hot weather. Bring a hat and suncream if you're going to sit on the top deck! You can hop on the bus at any one of the 33 stops around the city.